MCEDC's Incubator Program embraces business support services tailored to new and emerging companies with the intent to to create sustainable businesses which contribute to local and regional economic growth. The Oklahoma Small Business Incubators Incentives Act enables the tenants of certified incubator facilities to be exempt from state tax liability on income earned as a result of occupancy for up to 10 years (certain qualifications apply). 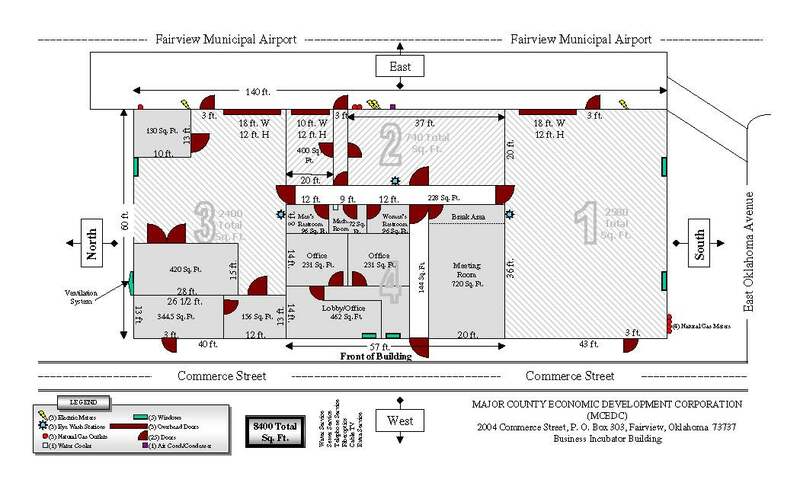 The MCEDC Business Incubator is certified by the State of Oklahoma and located in the Certified Site-Ready Fairview Industrial Park, which is on the north side of Fairview, adjacent to US Highway 60 and the Fairview Regional Airport. The 8,400 sq. ft. facility is divided into 3 industrial bays: one 2,580 sq. ft., one 2,400 sq. ft., and one 1,140 sq. ft. There is also a 462 sq. ft. lobby, a 720 sq. ft. conference room, and two offices of 231 sq. ft. Building layout below. Why should you consider a Business Incubator? Affordable space with flexible leases - first year free at MCEDC Incubator. Access to a team of business experts for objective professional advice regarding business plans, financing, marketing, accounting, and legal issues. Orchestrated exposure to critical business or technical support services. 24/7 access to the facility. Receptionist to greet clients at front entry. Access to office furniture - desks, chairs, filing cabinets, etc. Ten year state income tax exemption. Call today to schedule a tour of the MCEDC Business Incubator: 580.227.2512.